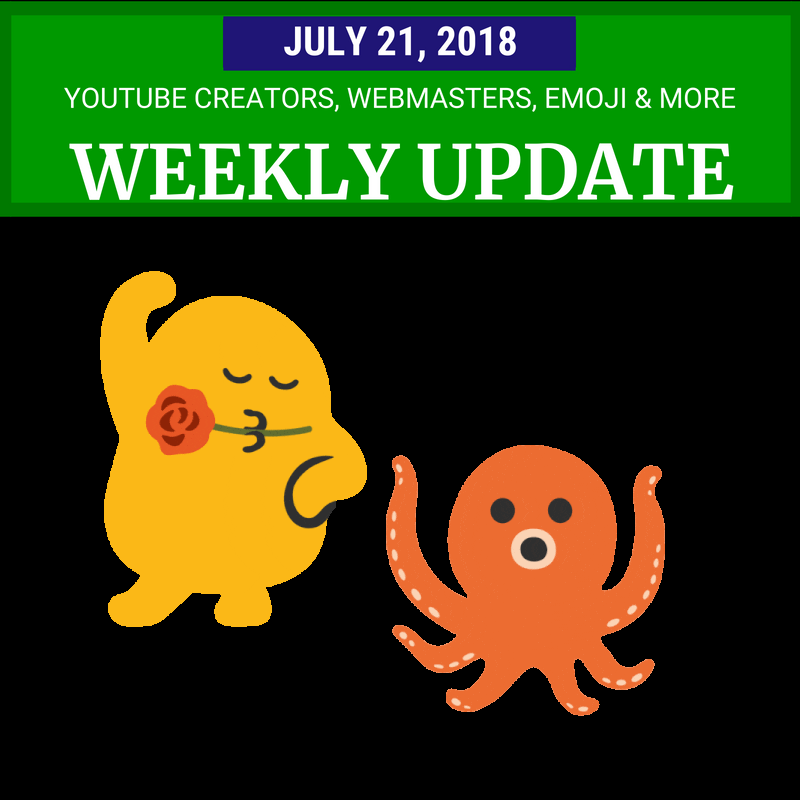 This week YouTube focused on Creators, the blobs are back and both Google and Facebook had a bad week. YouTube CEO Susan Wojcicki posted a mid-year update (and video!) on how YouTube is progressing on the five priorities for creators announced at the beginning of the year. Those priorities are better transparency and communication, better support creator success (i.e. make money), more options for viewer engagement, tightening and enforcing policies, and investing more in learning and education. If you’ve been following my YouTube updates, there wasn’t much new, except the announcement of a brand new initiative called “YouTube Learning” that will provide grants and promotion in support of educational content. No details as yet, but that sounds promising. Sometimes YouTube makes nice changes with no fanfare For example, now #hashtags from the video description are now visible above the video title. Before you go hashtag crazy, keep in mind that YouTube does have a number of policies about what is and isn’t allowed, and if you use the maximum 15(!) hashtags, not all will display above the title. Read the rules and pick your hashtags carefully. YouTube also announced that most YouTube Enhancements will be removed August 22. Trim and Blur will stick around and will soon be available in the new YouTube Studio. Usage of those tools is low and YouTube wants to focus on “improving other creator features and building new ones”. Sounds good to me. And some YouTube Gaming news: in March YouTube started merging channel subscriptions in regular YouTube and YouTube Gaming. That was paused because many users found the process confusing. Now it’s started up again, this time with clearer messaging. If you are a YouTube Gaming user you should have seen a message when signing in to your account. This week was World Emoji Day, and in celebration Google released new sticker packs for Gboard and Google Messages with the good old yellow blob emojis and their friends. I miss those cuties. Google Webmasters announced they are going to be rolling out a new referrer URL for Google Images, which will make it easier for webmasters to see the traffic coming to their sites from those pages. Google Assistant is getting more helpful. Information from your calendar, reminders, travel times, and upcoming bills will now be shown in Assistant, along with other helpful information based on the time of day and your location, to help you manage your day. Facebook had another bad week, with an undercover investigative report from UK’s Channel 4 highlighting questionable practices from a third party content moderator firm, including popular pages remaining up despite multiple violations, and instructions not to remove some violent and hate content. Also last week, CEO Mark Zuckerberg was heavily criticized for his attempt at explaining how Facebook tries to balance “keeping the community safe” with “giving people a voice” (including hateful conspiracy-mongers). Facebook has made promises to do better, but it’s not an easy problem to tackle, when one person’s “voice” can lead to harassment and even physical violence. And in the bad-news-for-Google department, the European Commission fined the company $5 Billion (with a B) for managing Android in a way that “harms competition”, for example not allowing device makers to run Google apps on unapproved versions of Android, and requiring the Google Search and Chrome apps to be bundled with the Play Store. CEO Sundar Pichai posted a detailed rebuttal of the charges, and Google is submitting an appeal. It’s not at all clear what this may mean for users. Read on for more tips and updates for webmasters, messagers, road trippers and more. Image: The (emoji) blobs are back!